It seemed like such a good idea. The organic peaches had just arrived at the market and were irresistibly beautiful! Plump and fuzzy little things in colors of the summer sun, deep coral, and bright, flushed cheeks. Gently going through dozens, I found six or seven that were perfectly ripe. I held a notion that peach galette and vanilla-cardamom ice-cream would be a heavenly combination. With the taste already in my mind, I was anxious to get started. I set the bags of groceries on the counter and began making the dough for the galette. I prepared the beautiful peaches, assembled that rustic little pie and popped it in the oven. In the meantime, I made the ice-cream. When everything was done, it all looked quite pretty so I snapped some photos. Then I plated it and took that much-anticipated bite. Everything about it was lovely…except the taste. The ice-cream was fragrant-like-a-flower delicious! But the galette – I don’t mean to be rude – but she was boring! It really didn’t matter how pretty she was…once you got past her looks, there was nothing there. I knew it wasn’t the fault of the peaches. (Naturally, as I was slicing them I’d slipped a few into my mouth.) I’d sweetened them some and spiced them nicely. Maybe somebody out there has a better idea, but I concluded that peaches and galettes, no matter how good they are on their own, don’t make a good pair. I haven’t had much experience cooking peaches…I love them fresh and bright and dripping juice. My thoughts then went to, Well, how do I cook them in a way that all those lovable things about peaches are preserved? How about if I grill them?! Of course this could be another good idea gone bad, but I had to find out. I headed back to the store, found a few ripe peaches I’d missed before, brought them home, and fired up the grill. Just a few short minutes later, I was sitting in the sun with my bare feet up, eating heavenly mouthfuls of cold ice-cream and warm peaches! The very first recipe I posted for this blog was an apple crisp. Here’s the ice-cream I’d promised to go with it. It’s almost indescribably good. Its speckled with black bits of vanilla bean and its flavor is carried on a cloud that touches your nose before the spoon meets your mouth. And if you try it, you’ll know what I mean when I say you’ll never be in a rush to swallow it. Its one of those things you’ll want to savor until the very last, melted spoonful. Put the milk, or light cream, vanilla bean and crushed cardamom pods into a heavy pan and bring slowly to a boil. Remove from the heat and cover and and allow to infuse for 20 minutes or so. 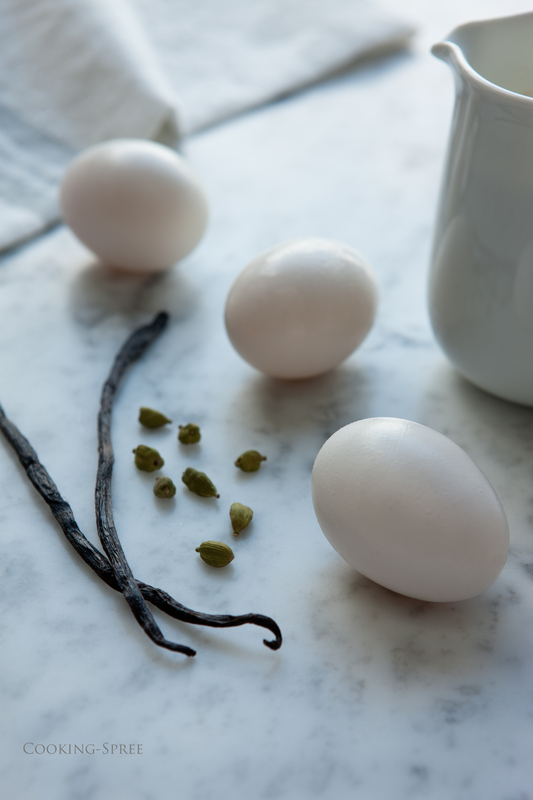 Remove the vanilla bean and scrape the seeds into the liquid. Remove the crushed green cardamom pods. Remove the pan from the heat and continue to stir until it has almost cooled. Whip the whipping cream lightly and fold it into the custard. Add 1/8 teaspoon of ground cardamom. Freeze in an ice-cream maker following the manufacturer’s instructions. NOTE: You want to only lightly crush the pods, allowing the “seam” to open enough to expose the little seeds inside, but not so much that you have many little pieces of cardamom that you’ll have to fish out later. If a few of the seeds make their way to the ice-cream, no damage done! NOTE 2: Cardamom is a wonderful, rather unique, spice. With many spices, you can double the amount called for. 1/8 of a teaspoon will be just perfect here. Much more than that and you could get a slight “soapy” taste. But please, don’t for a second think this ice-cream tastes like soap! So not! A post script to the post: It’s been running through my mind for several days now so I have to share: I think this ice-cream must taste like an exquisite orchid does to an insect with an appreciation for the finer things in life. Melt equal amounts of unsalted butter and brown sugar in a small pan. (Add a touch of cinnamon if you like.) Halve the peaches and remove the stones. Brush the peaches with the melted butter mixture and place them, flesh side down on a fairly hot grill (or in grill pan.) The idea is to brown them as quickly as possible. In maybe 2 or 3 minutes, turn them over. In a couple minutes they should be browned (but shy of mushiness), and their peach-ness will have concentrated! A very good thing! LOVE peaches. Never ever thought of grilling them. Guess you learn something new every day! That looks so scrumptious although if I have a choice when I’m eating raw peaches I’ll always go with the white variety myself–the taste somehow seems lighter and cleaner to me. On the other hand, I think intensely flavorful yellow peaches are probably better for cooking. I’ve never heard of cardamon in ice cream but I like it and do have cardamon tea every day. Maybe I could try to do a little cardamon “mix-in” with Haagen Dazs. I usually look for the white ones too, Joe, but I’ll always get the organic ones, whatever their color. Let me know if you try cardamom in your Haagen Dazs! Amazingly beautiful with those coral fuzzes and pewter accents. And your writing – so natural and light-handed. A pleasure. When my husband read this post, he said that I’d been too hard on the peach galette. OK, maybe so. I apologize. (But still – and this is telling – you won’t see me posting a recipe for it.) If you try grilling peaches, please let me know what you think! I thought they were intensely good! 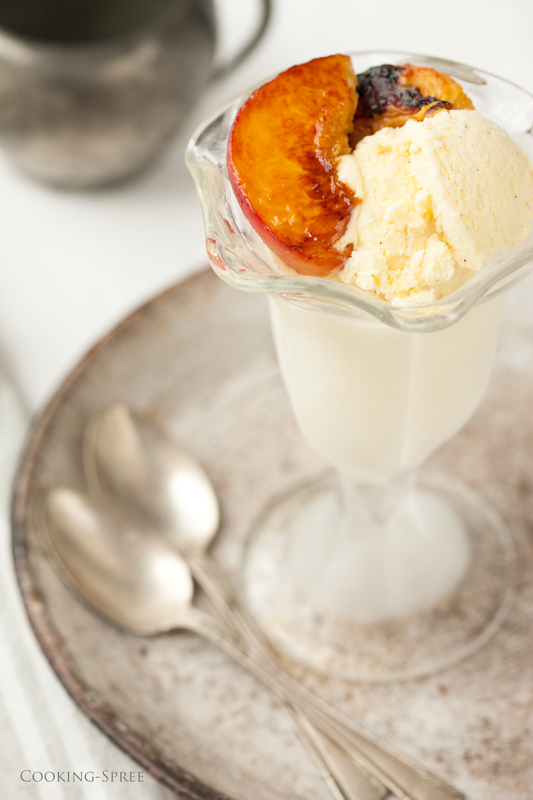 And instead of ice-cream with peaches on top, a scoop of the ice-cream plopped into the little peach cavity seems like it was ALWAYS meant to be. Let me know how you feel about that. I really like your writing and think that your cooking ideas and feel is very similar to mine. Hi Anne – Thanks so much for writing. And yes, please do let me know what you think…though honestly, I really haven’t much doubt. : ) Are you thinking of serving it with grilled peaches? (They’re quite amazing! But i know, out of season where you are.) From my point of view this ice-cream goes especially well with any warm fruit dessert, from a homey cobbler, to a simple yet elegant poached fruit, or a still-warm fruit pie. Let me know what you think though, will you? Please feel free to quote or borrow from my blog post and thank you for including a link to my site. I’ll look forward to hearing how your big dinner party goes.. Wishing you success and much joy in the process! Omg! Ani! It’s just the best combination ever!! I have always been a fan of true vanilla bean ice cream but I think I now have a new favorite. It will be served with my tiny Christmas puddings, along with 2 other desserts as a trio for my Christmas in July party on saturday night. It is of course winter here in Australia so it’s my chance to have traditional winter fare. Thanks for your generosity in allowing me to refer to you and your recipe. I love the sound of the grilled peaches and will be making them in the summer. I also thought figs would be perfect. By the way, did you see my preserves vanilla beans on my blog? I think you are a girl who could really use some! So, my husband didn’t want the usual birthday cake for his birthday last week. In fact, he begged me for no sweets at all, but when I saw this recipe, I knew I just had to try and boy was he glad that I did!! Truly he said this was his favorite dessert EVER. It is well worth the extra expense and effort to make your own ice cream with the authentic little beans themselves. Truly, amazing! Thanks soooo much for sharing this to-die-for dessert! !